But life in the country is not quite as idyllic as she'd hoped, and Jennie can't help wondering whether neighbouring farmer Guy Barnes was right when he told her she wouldn't last the year. Or perhaps the problem is that she's missing one vital ingredient to make her new life a success. Could Guy be the person to provide it? This is the third novel by Cathy Woodman in the Talyton St George series (preceded by Trust Me, I'm a Vet and Must Be Love). 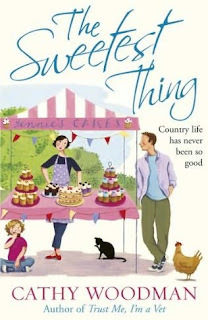 This book can be picked up without having read either of the previous two, since the events of The Sweetest Thing follow new character Jennie as she moves from the city to the country after a divorce to start up a new cake-baking business. Cathy Woodman is really getting up to speed now! I was a little uncertain about her first novel, but enjoyed her second thoroughly. This third one is by far the best. Jennie is a wonderful character - she's warm and friendly, but has foibles and is definitely incredibly stubborn. She is a very realistic character, and makes it very easy to take her part over the course of the events in The Sweetest Thing. Jennie is surrounded by equally memorable characters. Woodman has a real gift for natural dialogue, especially between Jennie and her three children. Sophie and Georgia are very sweet, the latter reminding me very much of myself when I was a child and was desperate to own a pony! Adam is a bit more prickly - Jennie's teenage son is hard to take to, deliberately so, and, although I didn't like him much, I could appreciate the stance he was taking and felt myself sympathising. The prose is incredibly easy to read. It flows and is very compelling, encouraging the reader to keep turning the page. Woodman has a very humorous turn of phrase at times, as well, which makes The Sweetest Thing a joy to read. What I like most is that Woodman doesn't hesitate in bringing harder subjects into what could be a very fluffy novel - Jennie is a victim of village gossip, she struggles with her teenage son, she suffers as a result of her former husband demanding sole custody of her beloved children. These are not easy subjects, but Woodman deals with them compassionately. Altogether, this was a very accomplished and entertaining novel, and I shall be eagerly awaiting the next instalment in the Talyton St George series. Be warned - if you read these novels, you will want to move to the country, own horses and dogs, and eat cakes!